BHOPAL: Villagers in a small hamlet of Damoh district in Madhya Pradesh, facing a third consecutive drought, has teamed up to find a solution for water crisis after failing to get help from the state government and district administration. With summer at its peak and mercury consistently soaring above 44 degrees Celsius in Bundelkhand region, water has become the most precious commodity in the region. Desperately looking for water, villagers have been digging a 100-year-old stepwell for the past five days in Madhia village, about 16 km away from Damoh district headquarter. Braving scorching sun, villagers stood on the steps of the well and joined hands to clear the debris, remove the weeds and dig it further to strike water. They work the whole day and when one of them is tired, the other replaces him. The volunteers in search of water include men, women and children. "Realizing that government support would not come, we decided to help ourselves. We started the movement with five people working in the well and five days later we are 25," said Janpad president Ranjeeta Patel while talking to TOI over phone. People are determined to fight against the odds. To mobilise people's participation, a priest delivering discourses on Bhagwat also made an appeal to the people of the village. Pandit Vishnu Prashad Puranik told a strong gathering of 250 people in the village with a population of about 550 people to participate in large number to "explore water in the well". Ranjeeta said, "there is only one government tube well in the village that has almost dried up. It runs barely two hours a day with a very thin flow of water from it. Two private wells on the outskirts of village within a km are main source." She said women have to walk up and down from their homes to these private wells to fetch water. "Any day owners of these wells can say no and then there would be major crisis of water". "More than a week ago, janpad panchayat wrote to the district collector about the crisis and cleaning and digging of the village stepwell but we did not get a reply," she rued. "With no hopes from the government help, we decided to help ourselves," Gaurav Patel, her husband, said. "From five people three days ago to 25 on Tuesday, I expect 100 people to join on Wednesday," she said. 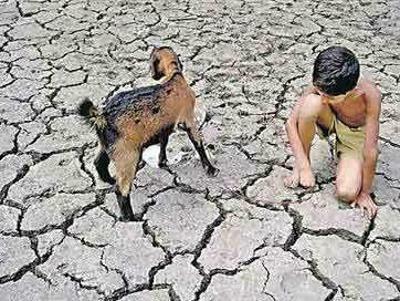 Damoh is among one of the five districts of Bundelkhand region of MP facing third successive drought. Last year there was hardly any rainfall and soybean crop failed almost completely in the region, he said. Villagers want to finish the work before the onset of monsoon. "We have great hopes after we heard monsoon would be normal and on time this year," janpad president Patel said.